In this tutorial we will show you how to install OroCRM on Ubuntu 18.04 LTS. For those of you who didn’t know, OroCRM is an open-source and simple to utilize CRM with worked in advertising devices for eCommerce business. This product is completely focused on the internet business. OroCRM offers the best functionalities being adaptable and additionally intense. 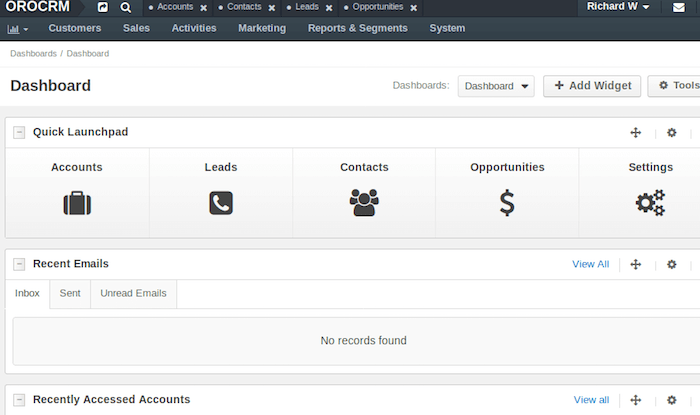 OroCRM can also be easily integrated with popular e-commerce platforms like Magento, MailChimp or Zendesk. This article assumes you have at least basic knowledge of Linux, know how to use the shell, and most importantly, you host your site on your own VPS. The installation is quite simple and assumes you are running in the root account, if not you may need to add ‘sudo’ to the commands to get root privileges. I will show you through the step by step installation OroCRM open-source and simple to utilize CRM on an Ubuntu 18.04 Bionic Beaver server. Step 3. Installing Node.js and Composer. Step 3. Installing OroCRM on Ubuntu 18.04 LTS. Step 4. Configuring MariaDB for OroCRM. Step 5. Configuring Apache web server for OroCRM. OroCRM will be available on HTTP port 80 by default. Open your favorite browser and navigate to http://yourdomain.com or http://server-ip and complete the required the steps to finish the installation. If you are using a firewall, please open port 80 to enable access to the control panel. Congratulation’s! You have successfully installed OroCRM. Thanks for using this tutorial for installing OroCRM open-source and simple to utilize CRM on your Ubuntu 18.04 LTS (Bionic Beaver) system. For additional help or useful information, we recommend you to check the official OroCRM web site. Related Posts of "How To Install OroCRM on Ubuntu 18.04 LTS"